IN STOCK, Enter number of feet you want to order. Price is per foot. 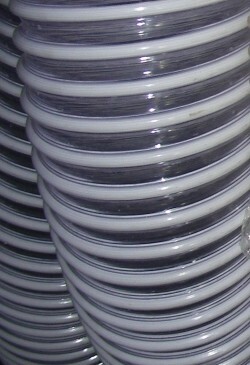 5" CLEAR PVC lawn, grass and leaf collection hose. Spiral Wound, Corrugated Exterior, SmoothInterior. Good for ducting, collecting and blowing light abrasives. Min. bend radius 5". IN STOCK! The shipping charge in the shopping cart is good up to about 20'. If you order more than 20', we will email you with the total and you can still cancel if shipping is too much, or you can choose to take multiples of 20'. Or if you really need more than 20' it can go oversize3 which UPS charges a $45 surcharge on top of the regular shipping. As long as you stay under about 20', we can ship it for what it shows in the cart.